Mako shark, (genus Isurus), either of two species of swift, active, potentially dangerous sharks of the mackerel shark family, Lamnidae. 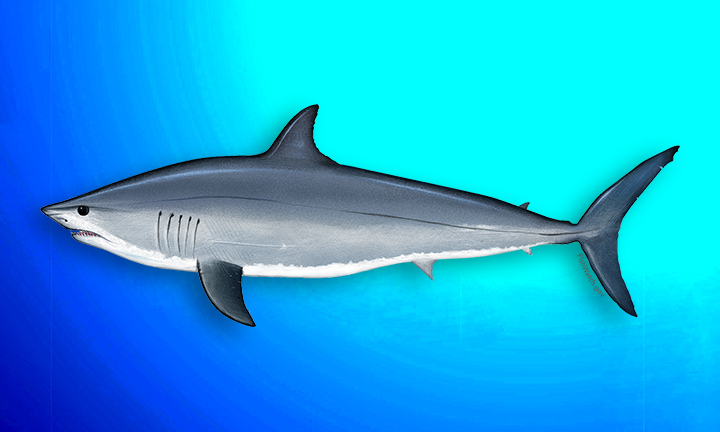 The shortfin mako (Isurus oxyrinchus) is found in all tropical and temperate seas, and the longfin mako (I. paucus) is scattered worldwide in tropical seas. Mako sharks, also known as sharp-nosed mackerel sharks and (in Australia) blue pointers, range throughout tropical and temperate seas. They are streamlined and relatively slender and have pointed snouts, crescent-shaped tails, and long slender teeth. Body coloration ranges from blue gray to deep blue dorsally and is white ventrally. The largest adults may approach 4.5 metres (14.8 feet) in length and exceed 500 kg (about 1,100 pounds) in weight. Mako sharks prey on fishes such as herring, mackerel, and swordfish and on small cetaceans. They are outstanding food and game fish, prized for their fighting qualities and repeated leaps out of the water.